The title is Deguchi no Nai Umi, translated as "A Sea Without Exit". 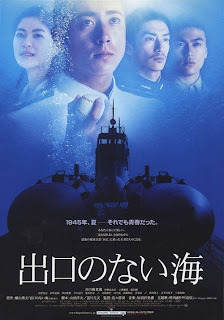 It is a film from 2006 about pilots of the Kaiten minisub. The plot sounds reminiscent of Ningen no Tsubasa (人間の翼) "Wings of a Man" from 1995, but I have yet to see either film, so can't really comment on them. Anyway, Fine Molds has made a 1/72 version of the submarine from the movie, which essentially is a manned Type 93 torpedo. The model is based on the Kaiten that is displayed in the Yushukan at Yasukuni Shrine. The build looked quite simple since it consists of a 15 piece Kaiten Type 1, and a 13 piece dolly for carrying the submarine. The model comes with the periscope molded in the up position, which didn't make much sense to me if the submarine was to be sitting on a dolly. To make the build a little more interesting, I decided to give the model a retractable periscope. All that was needed was a magnet and a piece of iron wire. 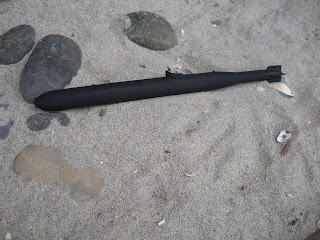 I removed the periscope tube from part #9, and then drilled a hole through the lower part and glued it to the hull. 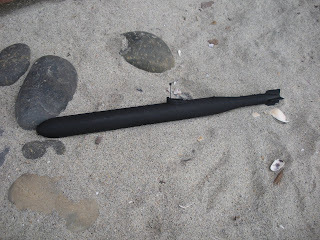 The upper part of the periscope was partially drilled, and glued to the wire. 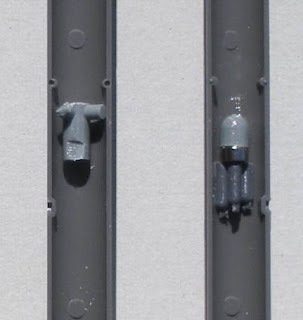 Using some sprue, I constructed a cradle for a magnet in the hull for holding the metal wire in place when the periscope is raised or lowered to different lengths. The kit was available through Eu-II (the mail order division of Fine Molds), but I believe it is now discontinued.